Razzle dazzle! Kids love it! They can spend an entire class period making their WordArt, text boxes, pictures, and shapes look amazing. But where is the content? I am nearing the end of the TechnoEnvironment unit. I was away last class so the Grade 8 students worked on their standing pamphlets on their own. At the beginning of class, I had the opportunity to view their accomplishments. To my surprise, each panel was full. I saw colorful borders, eye-catching WordArt, and stylish pictures. Missing from the panels were environmental FACTS! NOTE: This project has been a favorite for many years. Unfortunately, it is no longer available. To find other TechnoKids projects related to web design view the Project Matrix or visit the TechnoKids website. Students were supposed to create an informative pamphlet that explained an environmental issue including causes, harmful effects, solutions, and interesting facts. They had been given a checklist to keep them focused on the task. Half the students followed the instructions perfectly while the remaining students inserted text boxes to act as placeholders, left them empty, and then spent their time decorating the page. Razzle dazzle wins! Students prefer to format design elements instead of typing content. Have no doubt, learning has taken place. On their own, students discovered how to format the background of a Microsoft Publisher document. For example, the student completing a pamphlet on wildfires has an attractive gradient that starts out black and then gradually changes to red. Other than the text boxes empty of information, his publication looks fantastic! Other students have taken the time to discover the range of options accessible using the Design Gallery Objects command. They have created some unique designs using the objects. From a technology skills perspective, the kids are doing a great job. However, a good publication must have substance. In our case, the information pamphlet actually needs information. I let students know that although I am very proud of how they have applied their computer skills, no more design elements can be added until all facts have been placed onto the page. By the end of class, all the pamphlets have information. Now students will dazzle their audience with their knowledge of environmental issues! Tape the edges of the paper together to form a standing brochure. Okay, so things didn’t go as planned! The schedule looked perfect on paper…but then reality struck, so changes had to be made to the schedule. This is not a bad thing, it is a good thing. When teaching it is essential to modify your plans to best suit student needs. As long as your students are achieving the learning objectives, it is okay to modify the activities. In this blog entry, I will explain the decision making process I used to make adjustments to the schedule. At the beginning of teaching the TechnoEnvironment technology project in September, I made a plan. I looked at the school calendar and thoughtfully scheduled how I would fit the parts of the project into the 14 classes I had available in this school term. I considered the content knowledge the students would be required to learn as well as the technology objectives. Knowing that outcomes rarely reflect the planned schedule perfectly, I built in some space for change. I included extension activities that could be removed without compromising the integrity of the project and I left a free period at the end just in case we needed extra time. The schedule I had planned of course didn’t happen and the reality of school life intervened with my plans. There was a Professional Development Day I hadn’t counted on, some students were away sick, special school events were planned after my schedule was formed, sports activities took a number of students away from class, and some tasks took longer for students to complete. I had to make adjustments to my timeline. Sometimes a teacher might find themselves ahead of schedule and be able to fit in extra activities, but more often we are struggling to catch up. It often feels as if there isn’t enough time in the school day! Over half way through the project, I had a close look at where the students were as compared to what I had intended in my original plan. Based on my evaluation I decided to change the final activity. 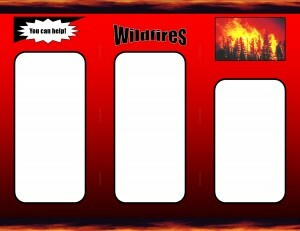 In TechnoEnvironment, the final assignment is a double sided, tri-fold brochure about a specific environmental issue. Completing all the requirements of the six sides is an advanced task which reviews all the technology skills the students have learned in the previous activities as well as some new ones. I decided to have students create a Standing Pamphlet with three sides, based on the Session 4 Skill Review in TechnoEnvironment. This required slight revisions to the steps in the technology project. However, I knew this change would best support learning. Apply skills to add content. Use checklist to review pamphlet. How did I decide what to delete from the schedule? From the answer, it is easy to determine the elements that could not be deleted. In the case of TechnoEnvironment I decided the importance of environmental stewardship and promoting environmental awareness about an issue were core components of the technology project and therefore must be maintained. In terms of technology skills I determined that inserting and formatting shapes, pictures, clip art, WordArt, and design elements were important skills that should be demonstrated in the final assignment. As well I also considered essential the desktop publishing skills that focus on layout and design to make a publication look professional. I decided that making tables and using a pre-built form could be cut. This is because tables will be taught later in the school year and a pre-built form is a design element unique to Microsoft Publisher and although a wonderful critical thinking activity, it is not an essential technology skill. When adjusting the schedule I gave careful consideration to the final task. I decided I would rather have less content but better quality. If I asked the students to create a six panel brochure they would not have had the time to do their best. By adjusting the scope of the final assignment to only three panels it would allow students to focus their efforts. 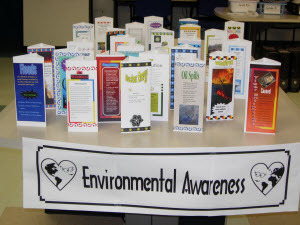 The Standing Pamphlet will provide students the opportunity to create a unique publication that will showcase their newfound technology skills, as well as effectively communicate their environmental awareness. Include blank classes in the schedule. This will give you some flexibility. Determine the essential learning objectives that must be included. Eliminate less important details and skills that can be covered at another time. Reduce the quantity of work, to allow students to focus on quality. Make decisions that will maintain student motivation and interest. Wow! What a challenging class. Today the students were VERY loud and lacked focus. Throughout the class period, it was a constant challenge to get high-quality work. Today, the class completed their Help Wanted environmental posters as part of the technology project, TechnoEnvironment. They had already done a direct instruction lesson on the poster elements in the previous class. In this class they just needed to add a caption and arrange design elements. The caption had to contain a simple sentence that explained to fellow students at the school what THEY could do to help solve an environmental issue. The technology skill emphasized during this lesson was desktop publishing. The instructional goal was to create an informative publication for a target audience that had a well-balanced layout, attractive design, and an effective message. NOTE: TechnoEnvironment has been a favorite for many years. Unfortunately, it is no longer available. To find other TechnoKids projects view the Project Matrix or visit the TechnoKids website. To help students write a meaningful caption, a list of ideas were written on the whiteboard. In addition, questions were posed about what action students could take to solve certain environmental issue. For example, to stop sharking finning students should not eat or use products made from sharks, to reduce the damage from oil spills students could ask parents to be careful when pouring oil into cars and lawn mowers, or to block the spread of nuclear energy they could donate money to research related to alternative forms of energy such as wind or solar. This brief discussion, paired with the ideas on the whiteboard, gave students the framework they needed to develop one meaningful suggestion to fellow students. Once the task was explained, I began to roam around the room supporting students while they completed their posters. When the printer starting churning out paper a few short minutes later, I was surprised. I knew the amount of work required today from students was limited, but it would likely take more time to complete. It was then that I realized the students were hurrying through the assignment so that they could have free time to play on the Internet. It is common practice for the students to have free time after they complete their work. This routine has been well-established throughout their years of schooling. During the past few classes, I have not witnessed any abuse of this privilege…until today. The work I was handed had spelling errors, clip art unrelated to the topic, poorly balanced design elements, and pixelated images. In all of these examples, it was clear that students were RUSHING their work. Moreover, many posters had captions that were not targeted to fellow students. It was clear – as little thought as possible was being given to this task. At the school where I am a guest instructor, Computers is not a graded component of the report card nor are the TechnoKids technology projects integrated into grading in other subject areas. I know that the students do not like investing their time in work that is not graded. By Grade 8 many students refuse to do their best work if there is no assessment. They are NOT internally motivated simply by knowing that they did a good job. This means that I have to “sell” every assignment. At the start of each class students must “buy in” to the task. In the past, I have done a pretty good job selling the task, however today my efforts were not working. How do you get Students to do their Best? Today, more than 10 students reprinted their work because their first copy was not their best effort. All student work is now posted to a bulletin board in the computer lab. Yahoo! Although it was a challenge, the work is well done. There are four students missing work. I have requested that they come into the computer lab to complete their edits. A print out for their work is to be handed to the IT support member who will then post it to the bulletin board. Grade Student Work: Older students value grades. Provide a marking sheet for a task ahead of time and then evaluate the final product upon completion. Authentic Audience: Have students share their work with an audience. You can post student work throughout the school, share work with another class, email work to an e-pal, or invite visitors into the lab to view work. Color Printing: A publication can be printed in color if the work is high-quality. Creativity: Provide more room for creative expression to make a task personally meaningful. Set Clear Expectations: Describe the expectations for a task explicitly. Self-Evaluation or Peer Evaluation: Provide a checklist. Have the student or a peer review the work to determine if it is complete.